Witches' Legacy: Slumbering Darkness is rated 4.1 out of 5 by 18. Rated 5 out of 5 by areti7 from A great game An excellent game that keeps you working, thinking and enjoying everything. Very good puzzles and interresting hops little different from the usual ones. Rated 5 out of 5 by ninja226 from my 1st foray into witches legacy--excellent You play the mother on the search for her daughter Lynn and hubby, who were abducted by the bad witch at a county fair. Well thought out story, plot, conclusion. Everything about this game is excellent. I will be trying out the other games in this series. The other reviews were very helpful, and on the mark! Rated 5 out of 5 by rpggramma from GREAT GAME!!!! Loved this game! Loads of things to see and do. Great HOs and Puzzles!! Good graphics; interesting plot. Keeps you involved and working. No bouncing back and forth, with good interactive map. Enjoy! Rated 5 out of 5 by rikkitwo from Absolutely Fantastic This is the 4th one I have played in this series and absolutely enjoyed it. Some of the puzzles are a bit hard but worth it. Will get the other ones for sure. Rated 5 out of 5 by denniann2 from save lynn and reunite the lovers it has a custom level. it has an interactive map and you have a friend, an imp, to help. this is the continuing series of morgana and she is the one that turned your dog into an imp. the HO scenes are not crowded. graphics are very nice. i enjoyed this game as much as the others in the series. sequel??????? well, morgana keeps coming back, doesn't she????? Rated 5 out of 5 by boatgirl4347 from ELEFUN CREEPS UP ON ELEPHANT!!!! BRAVO!! I JUST FINISHED THE CE AND TERRIFIC BONUS GAME I AM STILL IN AWE!!! I LOVED EVERY SCENE EVERY NOTE OF STUNNING MUSIC AND I GIGGLED EACH TIME MY LITTLE IMP (I NAMED HIM ZETTY) HELPED ME THIS IS A GREAT SERIES AND I HOPE YOU ARET DONE WITH IT!!!! I ALSO WANT TO TELL YOU THAT AFTERMONTHS ON MY SCREEN (I SHOULD BE WHIPPED) I GOT BACK INTO AND FINISHED 13KEYS AND I WAS STUNNED AT HOW FANTASTIC AND THE AMOUNT OF MINDBLOWING WORK AND CREATIVITY WAS IN THAT GAME!!!!!!! I NOW OWN EVERY ONE OF YOUR MASTERPIECES!!! THANK YOU!! Rated 5 out of 5 by charlene_lane from PART 4 - THEY SAVE THE BEST TIL LAST - ABSOLUTE GEM REVIEW FROM COMPLETED GAME AND BONUS This is a fantastic game and definitely worth playing. Lynn and Edward have been married now for 1 year. However, Lynn gets kidnapped by Morgana and Mathias and Edward gets turned into a doll. Edward stays in your inventory and helps out by making tools, etc from his tool belt. You can turn off Hint, Skip and Sparkles and turn on the HO penalty. I love having these features to make it as hard as I can. There is: * Voiceovers (with dialogue); * Casual, Normal, Hard and Custom modes of play; * Interactive map; * Imp to help you locate objects out of your reach. The graphics are fabulous - colourful, crisp and easy on the eye. Its very easy to roam around and find everything you need. There are no dark or blurry bits anywhere. Sound and music are very good. Music is orchestral and plays quietly in the background. The interactive HOS had a variety of silhouette and straightforward. Some were find one item to use to locate another item, etc. These had a good challenge to them, but not too difficult. If you don't feel like doing HOS then you can play matching pairs instead. I loved the great variety of mini-games. Some were move the figurines to the right slots; lead the train to the tunnel; clear the board of tokens; connect the dots on the constellation; light up all the gems; burn the blocks according to numbers; collect all the plants (that one was hard); move the crystals to the bases that match their colour, etc. Some of these mini-games had a really good challenge which took some time to do. However, wine helps! The interactive map shows where tasks are to be performed in case you get stuck. I found I didn't need to use it because you don't have to venture off too far and its easy to remember where tasks are to do. But its there if you need it. So, do you get the CE or SE? Personally I found the CE definitely worth buying. 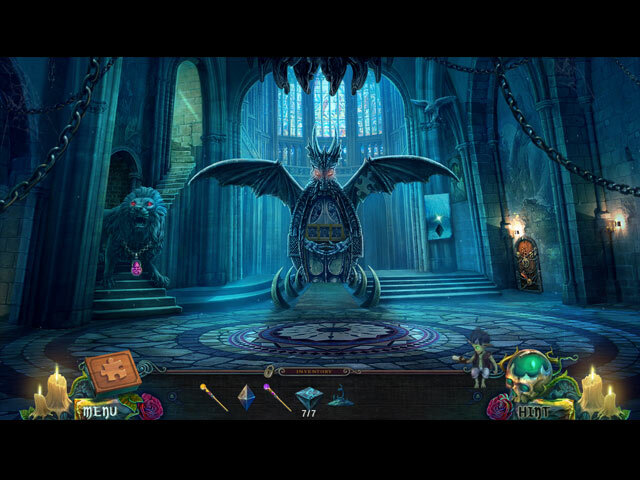 It has 33 morphing objects and 36 puzzle pieces to find, which have a good challenge. The bonus is a good length too, where you play Lynn to find and help Edward and to defeat Mathias before midnight. All up the game and bonus took me about 8 hours, give or take. Definitely recommended. I loved it and can't wait for the next episode. Rated 5 out of 5 by pennmom36 from And the Legacy Continues This is one of my favorite series of games, and I still enjoy the ongoing saga endured by Edward and Lynn. This Witches legacy began when Carrie rescued Lynn from Elizabeth, a terrible witch who killed Lynn's family, and turned her poor dog into an Imp! (I will admit I love that glowing eyed Imp)The legacy continued when the Queen of witches, Morgana, tried to lure Lynn to the darkside, thankfully Lynn resisted and vowed to only use her powers for the good of mankind. She met Edward and they fell in love, their relationship hit a bump when Lynn discovered that Edward was a witch hunter! They worked out their problems, and were married one year ago. The drama continues in Slumbering Darkness, when a powerful sorcerer kidnaps Edward with a harsh demand, that Lynn follows willingly, or never see Edward again! Just like the previous Witches Legacy's, Lynn uses her witch powers to create portals that allow her (and you of course) to travel to weird places in an attempt to rescue Edward from the evil sorcerer. That cute Imp (wonder what he looked like as a dog?) has donned his backpack, and waits patiently to retrieve items that otherwise would have to be written off. There are plus signs on some of the inventory items that indicate some type of interaction is required before you can use that item, such as, combining that item with another inventory item. 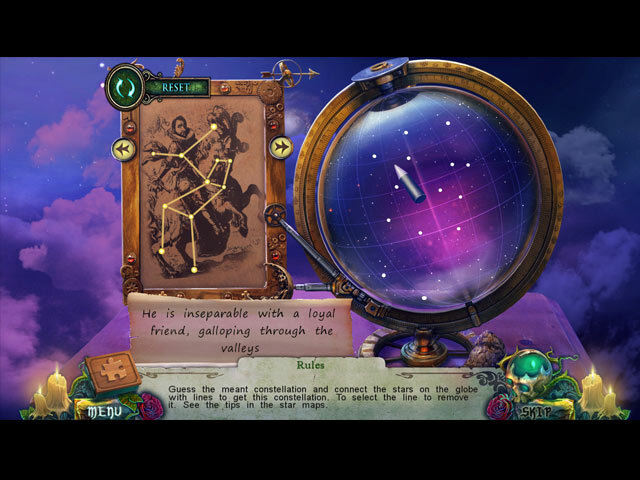 The Collectors Edition has several achievements to earn, including using the Imp's assistant, and has 36 hidden jigsaw pieces that can be assembled when you find all pieces, to learn a story about that character. There are also 33 Morphing objects to find which is my favorite feature, so I opted for the Collectors Edition of this game. 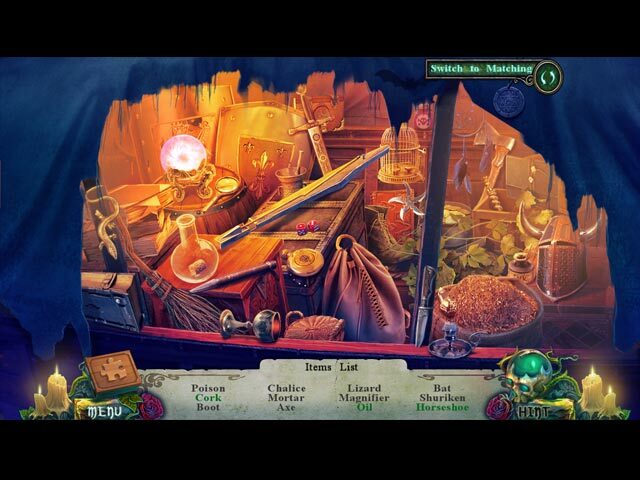 The Hidden Object Scenes are extremely interactive, you might have to find items such as keys or masks, to unlock the list first, and then there are several items that are interactive within the listed objects. You can opt to play a Matching game, by flipping over two cards at a time to match identical pictures, but the HOP's are really entertaining and none are boring in my opinion. Mini games are just as entertaining, there are small games in zoomed in areas where you have to find several objects on the outside of the zoom, and there are longer, more complicated games such as leading a train to the tunnel. There are three trains of different lengths, that need to be guided to different slots in order to clear the tracks to allow the train that the imp is conducting, to the tunnel. The Collectors Edition of Witches Legacy: Slumbering Darkness has Wallpapers, Screensavers, Achievements, an Art gallery, 36 hidden Puzzle Pieces, 33 Morphing Objects, Soundtracks, Puzzles, a built in Strategy Guide and a Bonus Chapter. Either edition is top notch entertainment, enjoy! Rated 4 out of 5 by Kimmycoo from Another Great Installement I enjoyed this one! The music and voice-overs, cut scenes, the graphics. Loved some unique mini games too. Though Ive seen prettier scenes in other games, I still wanted to teleport through the screen into some of the places you visit. I got a kick out of the little imp. The dog turned imp. I love his little sounds and the shenanigans he pulls. Its a lot of fun having a little sidekick with you. I have never said this but once I beat the game and the credits started rolling, I loved it. As the credits roll and the names start coming up you hear what happened to Lynn and her aunt and you hear several characters from the game to, I loved that the developers took the time to make the credits worth watching. I recommend the game!